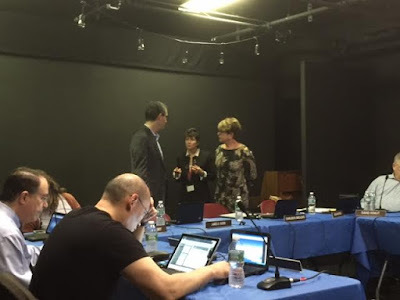 As previously reported,Roosevelt Island Operating Corp (RIOC) President Charlene Indelicato is leaving RIOC to take a position as Dobbs Ferry Village Administrator. Ms Indelicato's last day at RIOC is March 18. Current RIOC General Counsel Susan Rosenthal will be the Acting President/CEO until a permanent President/CEO is selected. Ms Indelicato gave her final RIOC President's Report at last evening's RIOC Board of Directors meeting. Relationship with Board of Directors, residents and RIOC employees. Following Ms. Indelicato's remarks, the residents, RIOC staff and Board members in audience thanked her for her service to the Roosevelt Island community with a round of applause. 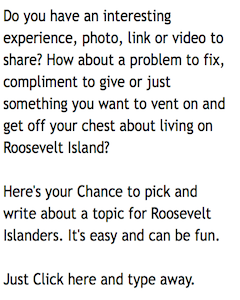 Here's the final Roosevelt Island Report from RIOC President Charlene Indelicato. RIOC Board Chair Jamie Rubin reported during the meeting that an independent search process for a new RIOC President will be conducted. UPDATE 12:30 PM - Jamie Rubin, RIOC Board Chair and Commissioner of NYS Homes and Community Renewal, thanks RIOC President Indelicato on her service to the Roosevelt Island community.